The majority of the objects that have been created with additive manufacturing technologies are hard, and the technologies are meant for creating only hard objects, mainly from metals or plastic, ceramics or food items. This time a team of scientists from Disney Research and Carnegie Melon University have constructed a 3D printer, which can layer the sheets of laser cut fabric together, thus creating 3D objects with .STL files, like those for conventional 3D printers. So far the team the new technology has been used to produce almost anything from doll clothing or stuffed animals to smartphone cases. The technology allows to develop patterns that possess circuitry built into the final designs. So if you happen toned some electrical function, like light or sound, it’s always there with you. Associate research scientist from Disney Research Pittsburgh Jim McCann told that nowadays new 3D printers help to produce custom rubber, plastic and metal objects. However it is still difficult to 3D print objects from soft fabric, and they have to be created by hand. Layered fabric printing is the only possible technology to make the production of such objects automatic. The Disney Research centre is a network of research labs, which encourage technological development of the Walt Disney Company. Other purposes include the advancement of the entertainment and media efforts by carrying out technological and scientific innovations. There have been previously carried out other breakthroughs by this group of researchers that found their ways to almost anything from toys to amusement park experiences. The printer created by a team of researchers (including Huaishu Peng, a Ph.D. student in information science at Cornell University, and Scott Hudson and Jen Mankoff, both faculty members in Carnegie Mellon’s Human-Computer Interaction Institute) led by McCann and other printers available on the market are very much alike – all of them work with individual thin layers, which are joined together. That’s how large 3D objects appear. However, in contrast to conventional 3D printers, the fabric 3D printer combines additive manufacturing and material subtraction (or laser cutting) processes. They are represented in the appearance of the printer as the lower platform for joining and the upper one for cutting. 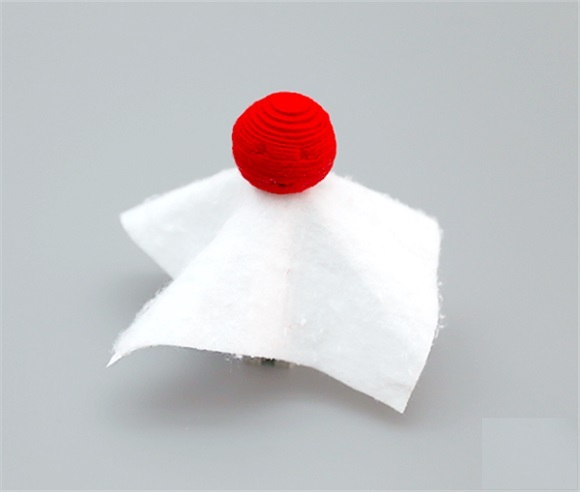 To create an object they insert the fabric into the device. At the same time the vacuum holds it in front of the upper platform. As soon as the fabric if secure, the laser head excises the shapes according to the requirements of the file. As soon as the cutting is over, the joining platform rises to the material, and the material is free from the vacuum. The platform lowers and the joining process starts. The layers of fabric are coated with heat-sensitive adhesive and are then pressed together with pressure and heat at the same time. When the process is over, the “supporting fabric” is released and the necessary 3D printed object is ready. Other demonstrations included a special technique to produce a 2,5-inch bunny from 32 layers of 2-mm-thick felt. All in all the process of developing a three-inch tall soft 2D print was over after nearly 2,5 hours. The scientists also found out that they can alter the object’s stiffness adding cuts on the inside of each layer, which would influence bending properties. 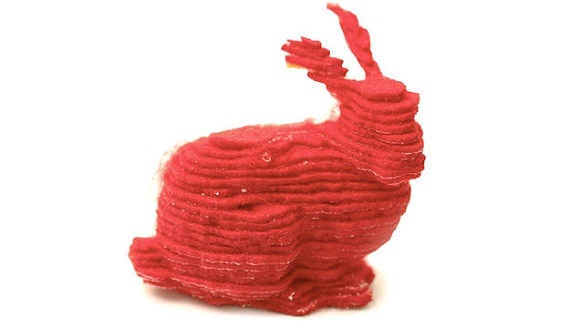 The layers of the bunny are visible, as the bunny is quite small in comparison with the felt that was used to print it. It is a kind of compromise – with thinner fabric the printing time would increase, but the layers would become less obvious. The printer was represented during the Association for Computing Machinery’s annual Conference on Human Factors in Computing Systems, CHI 2015 in Seoul, South Korea.